Regardless of its practicality, there is a touch of romance to a MiG-25 business jet. Here's why. A photo of a model MiG-25 business jet shows what might have been. 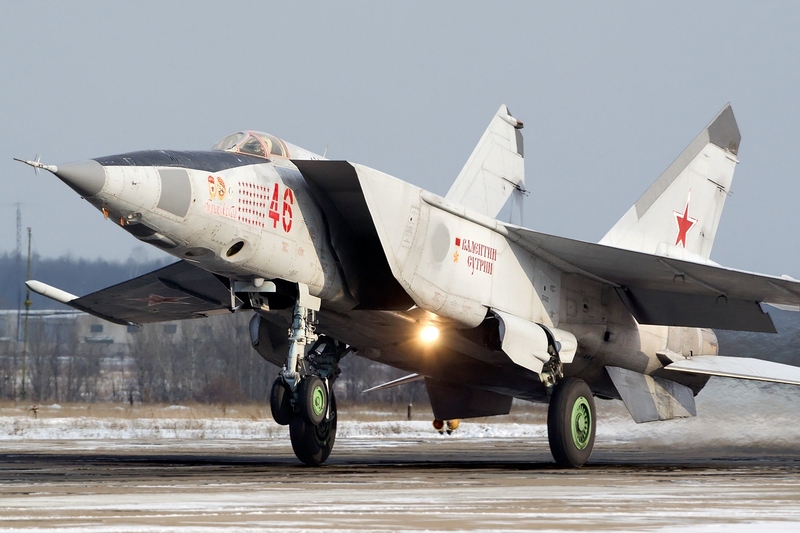 The model indeed looks like a MiG-25 fighter with its distinctive air inlets, wings and double tail, but the wings are larger and the fuselage is wider and longer. "Behind the flight deck was a passenger cabin with one-abreast seating for six and an aisle, with a portside entry door immediately aft of the flight deck," according to Gordon and Komissarov. "The cabin could be converted for cargo carriage by removing the seats." The MiG-25 business jet would have carried five to seven passengers or up to 2,000 pounds of cargo at a cruising speed of Mach 2.35. Additional fuel capacity was added to stretch the fighter version's 1,200-mile range to 2,200. The idea originated with MiG, not the Soviet government, which wisely vetoed the project. A 2,000-mile range, about the range of today's Learjet 70, doesn't sound too bad. But the distance from Moscow to Vladivostok on the Pacific coast is almost 6,000 miles. A short-legged jet would be impractical to traverse the vast expanses of the Soviet empire. Nor would Foxbat Airways been economical to operate. The MiG-25 was a maintenance hog (not least because pilots and ground crews partook of its alcohol de-icing supply, leading to the nickname "The Flying Restaurant"). Western observers were amazed when MiG-25s flew over Israeli positions in the Sinai desert in 1973, at a speed of Mach 3.2. Only later did they learn that to fly at that speed, the Foxbat's engines had to be replaced after each flight. The focus of modern air travel which is how to move lots of people at little cost to the airline. A maintenance-hungry MiG that could only a transport seven passengers would have been no revolution in air travel, but rather a highly militarized Soviet aerospace industry looking to find some practical, non-military uses for its products. On the other hand, the Soviets were always keen on prestige projects; the world's first supersonic business jet would have had some propaganda value regardless of the economics. In the end, converting a jet fighter into a commercial aircraft doesn't make a lot of sense. Fighters like the F-22, Su-35 or F-35 are optimized for combat, not cargo. Besides high maintenance and fuel costs, fighters are optimized for air combat, not hauling people in comfort. Still, while the idea sounds crazy now, it must have seemed possible in the heady 1960s when supersonic airliners were the holy grail of air travel. It was an era that spawned Europe's Concorde and America's abortive SST, and the search continues today: Airbus and Aerion Corp. announced last year that they will develop the world's first supersonic business jet. Regardless of its practicality, there is a touch of romance to a MiG-25 business jet. While today's airlines can make us fly with our knees in our faces, they can't stop us from dreaming of a Mach 3 flight on the ultimate airliner.